My primary excitement in getting Liam an iPad was to enable him to communicate with us. It has to be frustrating to be asked a question and not be able to answer it except for a smile. If I asked him if he wanted to sing a song he would smile so I would know he wanted too. But other than a smile, there is no way for Liam to reply his likes or dislikes. So the first app I got Liam was simply called the Yes/No HD app. 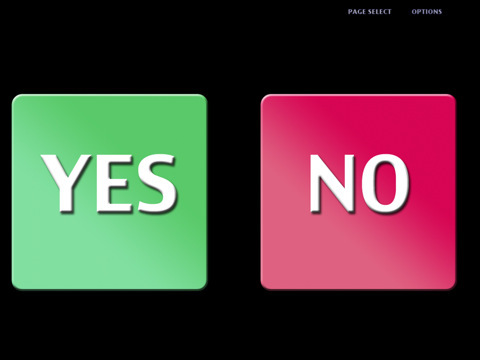 It puts on the screen a red box that says no and a green box that says yes when they are touched. You can also make your own buttons and record your own voice to them but for now we are only working on yes and no. Today my homework from our private SLP was for me to work on vocabulary with Liam. Because Liam knows cause and affect, having him touch the screen is no big deal. But having him meaningfully touch it to answer our questions is something else. He is getting the hang of it. For instance, this morning we asked him if his name was Liam. He said yes. Then we asked if he was happy and he said yes. We asked him if his SLP was named Ms. Becky and he said yes. Then we worked with abstract photos of a ball, cars, and a cat. He did about 50% on those. When we would ask him if the cat was a cow or the cat was a duck he would sometimes say yes and sometimes say no. Part of that could be that his coordination to hit the right buttons are off and it could be that he simply doesn't understand yet what yes and no mean. So my homework is to work with him several times a day on the concept of yes and no. I am to ask him if he wants to get in his stander or out of it, if he wants to read a book, sing a song, etc... And I am to work with the vocabulary, e.g., "Is the apple blue?" If I could pair the yes/no app with something he really didn't like it would probably teach him quickly. Say he hated to have his hair brushed and we asked him if he wanted to have that done, whenever he pressed yes he'd get exactly what he hated teaching him yes and no pretty quickly (hopefully). But I can't think of anything that is uncomfortable to him or that he doesn't like. He's so easy going. If you have any ideas on what we could do or what worked for you please let me know!